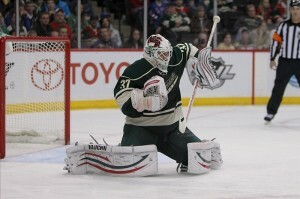 This is the first article in a series of three on the Minnesota Wild. There will be no playoff hockey for the Minnesota Wild once again in 2012, but the 2011-12 season has once again left much to discuss and consider in Hockey Town. GM Chuck Fletcher doesn’t have the easiest job in front of him, and what he feels he needs to do will be strongly based on how he perceives his roster performed during the season. This series of articles will grade every player that skated for the Minnesota Wild during the season. It starts today with the goaltenders, then moves onto the blue-liners next week and finishes on May 2 by looking at the forwards. The 34-year old appeared in the second lowest number of games during his career largely due to injuries. The problem for Backstrom wasn’t that he ever really suffered a major injury that kept him out for a large chunk of the season; he just seemed to have a season where he was constantly in and out of the line-up. It was pretty clear that he was dealing with niggling injuries through most of the season, and while the blame for this year’s failures undoubtedly falls at the feet of an anaemic offense; Backstrom’s injuries did not help matters. His numbers were actually up from the past two seasons. He finished with a .919 save percentage and 2.43 GAA, while recording four shutouts. This wasn’t quite the Backstrom who took the league by storm in his first three seasons going from strength to strength, but it was a definite improvement on the last couple of years. Next season is a contract season and there will be some big decisions for the Minnesota Wild to make, but despite his age, Backstrom can be likened to a Tim Thomas. He has only played in six NHL seasons and has only appeared in 60+ games in any hockey season twice. He doesn’t have the wear and tear of a Martin Brodeur or a Roberto Luongo, and should be able to play for several more seasons. Fletcher’s evaluation of Harding could be the most important decision that the Minnesota Wild make this offseason. The career back-up returned after missing the 2010-11 season with injury and initially everyone’s attention with an outstanding start to the year. He also experienced his fair share of injury difficulties this season, and like the rest of his team, his play tailed off after about mid-December. A free agent this season, it is pretty hard to decide whether Harding’s early season performance was the beginning of his coming of age, or just a good run by a career back-up. The 27-year old is a former second draft pick and definitely has a lot of talent, but there are legitimate concerns about his all-round game. The biggest problem that Fletcher will have to face in the offseason is that Harding is a UFA. The problem being that he may well see this as his opportunity to earn a good pay day and potentially even join a team that wants to give him a shot as a starter. The Wild need to decide whether it is worth spending what Harding wants to keep him in Minnesota, or whether they are better off letting him go. Regardless of whether he will want more than he deserves, there is little question that Harding did take a step forward statistically this season. He appeared in a career high 34 games and posted a solid .917 save percentage. He also had two shutouts. Hackett wasn’t really considered as a factor heading into this season. Rather the 22-year old was expected to mature in the AHL with the Houston Aeros this season before potentially taking Harding’s place in the back-up role in 2012-13. That may well still be his fate, but his 12 NHL appearances in 2011-12 have more than cemented the young goaltender’s status as one of the top prospects owned by the Minnesota Wild. He finished with a .922 save percentage and 2.37 GAA in those 12 appearances. He started his NHL career by stopping all 34 shots he faced in a relief effort against San Jose on Dec 6 and followed that up by making 42 saves in his first full start against LA two days later. His performances were a little less consistent later in the season, but the experience gained should be invaluable for Hackett.